COLUMBUS CIRCLE — The holiday market at Columbus Circle opened for the season Wednesday, one-third larger and with twice as many food options this year, according to organizers. The market, a maze of open-air booths and a dining deck, features more handmade goods this year, too. 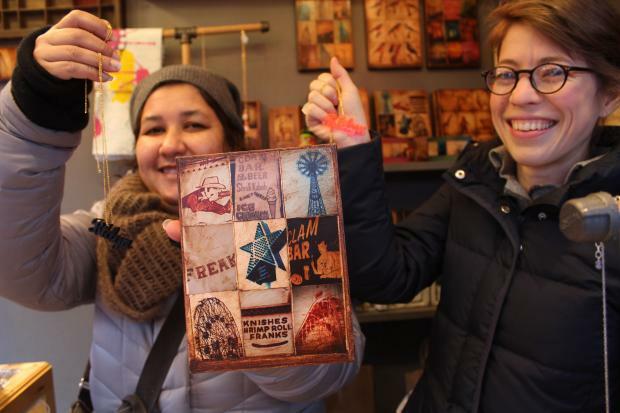 "We have a lot of Etsy people," said Julie Feltman, who directs the market for the company Urban Space, which also runs Union Square's holiday market. The Etsy members, who ordinarily sell their goods on Etsy's online marketplace for independent crafts makers, are bringing everything from handmade scarves to urban photographs to the Columbus Circle market. In all, the market has more than 120 vendors, and about 40 are new this year, including Fat Beagle, which serves Southern comfort food, Feltman said. Eric Pierre, a manager at the market, described the Columbus Circle fair as appealing "more to an upscale crowd," whereas Union Square tends to attract a "trendy, hipster crowd." "[Columbus Circle] is more of a high-end, artisan market," he said. Gerd Stoeckel is helping run a booth called Lil' New Yorker, which offers goods for children and babies from five New York City-based designers. "[Last year] we did really well — we had to restock several times," Stoeckel said, adding that customers' favorite item has been a $26 "I Love New York" onesie featuring an illustrated cockroach, made by Dina Lerman of the company Bugged Out. "We like the atmosphere of this market," Lerman said. "It has more of a neighborhood feel than Union Square. It feels more quaint." After her success at the market in 2011, Lerman recruited more Etsy-based designers, part of a group called Etsy New York, who offer each other tips and support. Aimee Schiwal formed an Etsy collective called I Am Here Brooklyn, which combines three designers in one booth to help defray the cost of renting a spot at the market. A half booth costs $5,500 for Nov. 28 to Dec. 24., which Schiwal thought was a good deal when split three ways. Another new Etsy collective at the market is The Sixth Borough, made up of nine sellers, including Elena Kanidinc, who sells green housewares like slate cutting boards made with material salvaged from local roofs. "We felt like Columbus Circle was more of a venue for us, for our stuff," she said. "I think this market is one of the best in the city." Kanidinc was joined opening day by Angeliki Jackson, whose company Astrodub creates urban landscape photographs, and by Dawn Stewart, who creates scarves, hats and jewelry at DS.Lookkin. "It's exciting," Kanidinc said. "We are local and we use local materials...and we like to meet our customers." The Columbus Circle holiday market is open Monday through Saturday from 10 a.m. to 8 p.m. and Sundays from 10 a.m. to 7 p.m. through Dec. 25.